This verse reminds me that with God on my side, nothing can tear me down. That is sometimes not as easy as it seems. Recently, my husband and I have joined a new small group at our church and it has been so awesome getting that time to dig into the Bible and it not be for a youth lesson. It has really helped me keep God at #1 and make my days go a little smoother. My youth job is actually getting busier with the new school year starting so Printable Creations will probably start being once a month. I want to keep this creative outlet going and have to work on figuring out a new balance with my youth coordinator job. Hope you enjoy my newest Printable Creations and enjoy seeing my process below! 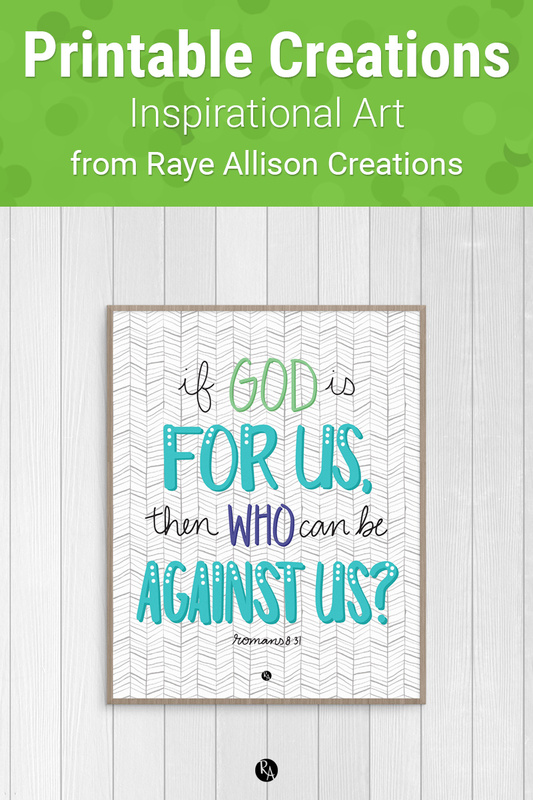 If God is For Us Bible Verse Printable from Raye Allison Creations. This week's printable quote is, "If God is for us, then who can be against us?" Printables are great for home or office decor, classrooms, church bulletin boards, and so much more! Each Printable Creations will be available for a month when the new Printable Creations is available. But the printable won't be gone forever! Once a new printable is posted, I add the previous printable to my Etsy shop. Sign up with your email address to receive a new printable quote in your inbox every month.